For the last couple months, I've had the opportunity to cook with Anolon's Nouvelle Copper Stainless Steel 3-qt saute pan. We cooked with it in a variety of ways to get a good overall impression of the product. I'll start off with a physical description of the pan. 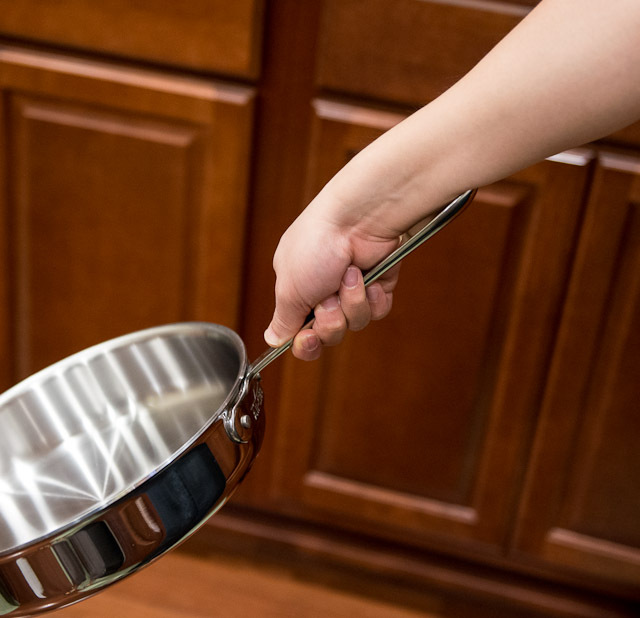 The body of the pan is magentic stainless steel (I measured the top edge at 1/32-in [0.8 mm] thickness) with a multi-layered metal disc attached to the bottom forming a thick base. The depth of the pan is approximately 2.75-in (7 cm) and measured a maximum capacity of 3.01-qt (2850 mL) when filled to the rim. 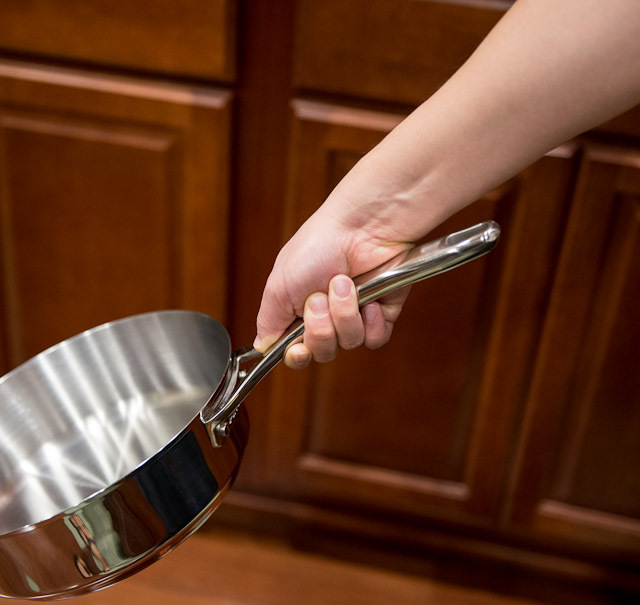 The pan weighs 3.8-lb (1730 g) without the lid. The primary handle is 8-in (20.3 cm) long. Construction of my unit was excellent with tight rivets, solid construction, and no visible gaps. 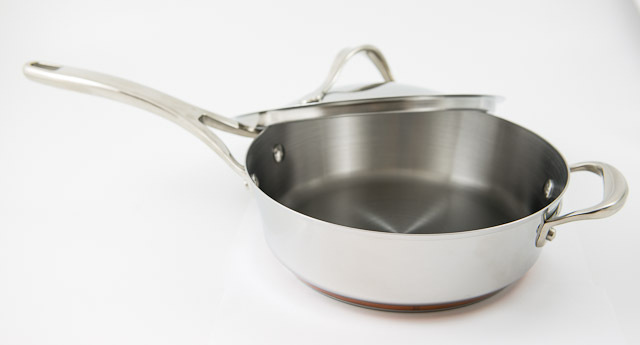 The stainless steel body of the pan has a mirror finish on the outside and brushed finish on the inside. The sides are angled and appeared to be straight (flat / not curved) but upon closer inspection have a slight flare. The top edge of the pan appears to be folded down (rolled) to form a thicker edge. 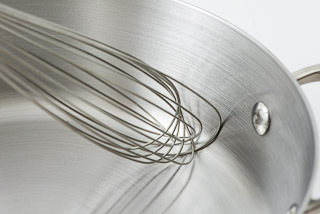 The effect of the rolled edge seems to be similar to that of a flared lip - liquids poured out of the pan do not dribble down the side of the pan as much as a straight cut edge. The base is constructed of "a layer of copper, encapsulated with aluminum, followed by stainless steel" (according to the product documentation). The bottom most layer, which appears to be a solid disc of magnetic stainless steel (I slid a small rare-earth magnet to see if the stainless steel extended up to the copper/aluminum layer - the reaction of the magnet indicates the layers are distinct), was approximately 1/8-in (I rounded - my measurement was 11/128-in [0.0859-in; 2.18 mm]). The layer above the stainless steel layer and is directly connected to the bottom of the pan's cooking surface is composed of a combination of copper and aluminum. From the product description, it would seem that there should be a core disc of copper with aluminum on the outside, but, from the appearance, there is a copper band showing. It's unclear to me how the layering of aluminum and copper is handled on this layer and it's quite possible that inside this region is a copper/aluminum layer with a copper band outside for aesthetic reasons. This copper/aluminum layer is much thicker than the stainless steel layer at 5/16-in (I measured 43/128-in [0.336-in; 8.53 mm] and rounded to 5/16-in). 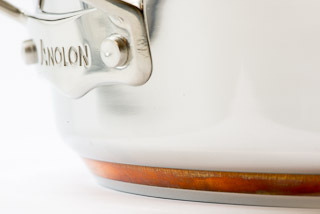 Anolon Nouvelle Copper Stainless Steel Cookware Set 2012 Giveaway! I used the saute pan on a 17,000 btu gas range, a 1800 W induction cooktop, and inside an oven (temperatures ranging from 200-350°F/93-177°C). The pan heated evenly because of both the thick stainless steel base and thick core of aluminum and copper efficiently spreads the heat over the entire base of the pan. Thick layers of stainless steel typically take longer to heat up and can retain a decent amount of heat which helps to even out / smooth temperature fluctuations. Because of this, the pan takes longer to heat and cool than other similar pans that I've used. That steel core does appear to do a great job delivering even heat to the aluminum and copper layer which spreads it out before imparting it to the stainless cooking surface. It's a bunch of layers, but it's effective. 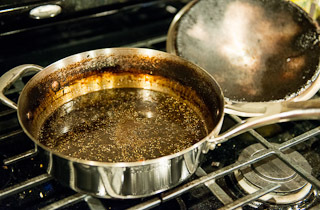 This results in fewer (or non-existent) hot spots especially when cooking over medium or lower heat. When a pan doesn't have any major hot spots, it's a easier to cook with and a lot more forgiving. Cooking down some onions in a thin stainless steel pan can result in some onions being raw while others burnt to extreme bitterness if the cook walks away for a few minutes or is distracted by something else in the kitchen (or on TV). Good pans (those that I like to use and recommend to others) heat evenly which means there's less of a chance for some of the ingredients to start to burn unexpectedly early and less of a need to constantly mind the pan. When I cooked a batch of ice cream, I found the interior curvature of the pan to be gentle enough to allow a whisk to easily get into the corners. The depth of the pan didn't make it suitable for pan frying (too deep to effectively use a spatula to flip food easily), but it was good for shallow frying (think fried chicken). In addition, sauteing was difficult due to the weight distribution of the pan. Since the majority of the weight is focused on the bottom of the pan, I found it nearly impossible to smoothly move the pan to toss any ingredients inside. In fact, the pan is so heavy and the weight distributed in such a manner that Tina could not continue to use it. I found that even though the long handle was the same length as those found on most pans of this size, the construction didn't allow me to grip it as close to the body of the pan as I normally would. Normally, on an 8-in handle, my grip is pretty close to the body (I use an oven mitt if the pan is hot) which allows the end of the handle to rest under my forearm providing additional leverage and making the pan easier to control. With this pan, my grip was forced to be further back which made the handle too short to help as extra leverage. This second photo shows a 3-qt saute pan with helper handle from a different manufacturer which has a handle that fits easily under my forearm providing more leverage. Now that I posted the pictures and had a chance to inspect them from an angle that I wouldn't have been able to see on my own body, it seems like it's more due to the curvature of the pan's handle that makes it harder to hold. The Anolon handle curves downward instead of being straight. With the balance issue the only main complaint I have about this pan, it's an excellent selection for a multi-purpose pan in the (just under) $100 price range. At publication time, this pan is on sale at Amazon.com for $80. Anolon is running a giveaway on their Facebook page for this pan. Just go to this page, like Anolon, and register to win. I'm not sure, but I think it's only for this week and valid until December 15 or 16, 2012. 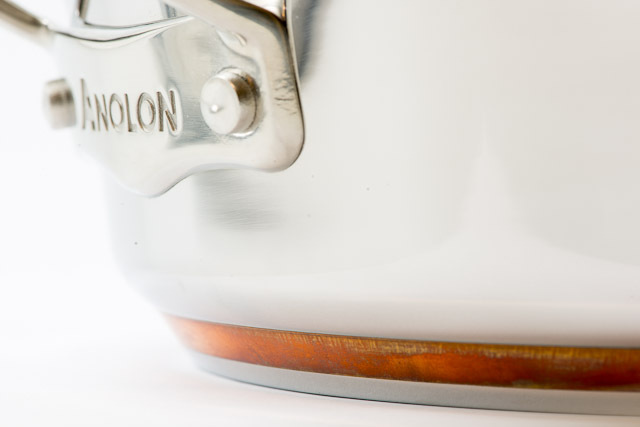 We're also giving away one Anolon Nouvelle Copper Stainless Steel Cookware 10-piece set to a lucky reader. Read this article to find out how to enter: Anolon Nouvelle Copper Stainless Steel Cookware Set 2012 Giveaway! Anolon just posted an interview I did with them as part of their Cook & Tell blog series. Be sure to enter a drawing for a chance to win a brand new 3-qt saute pan off of that page.